It's crunch time! With just days left to shop in Bryant Park, Tricia of Fashion Herald shares one of her favorite boutiques at The Holiday Shops at Bryant Park. I had gorgeous product photos that sadly were eaten by my laptop. So now you just have to visit and check out their irresistible sweaters and flower scarves! 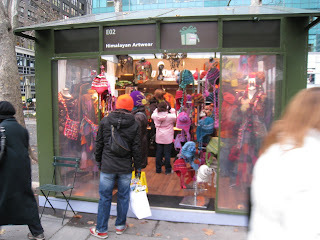 This is the fifth season of Himalayan Artwear (E02) in The Holiday Shops at Bryant Park, and it's still one of the best shops in the park with its beautiful hand-embroidered, hand-knit, and hand-felted clothing and accessories from craftspeople of the Himalayas. Stylish, well-cut, and unusual pieces abound in this holiday shop, so for those of you who love the look of handknit and colorful sweaters and jackets, but don't want to look too roughhewn, Himalayan Artwear is a must-visit. Happy New Year's Eve, and happy final days of The Holiday Shops in Bryant Park!